F stoi na stanowisku podkreślającym podobieństwa formalne pomiędzy typami nauk. 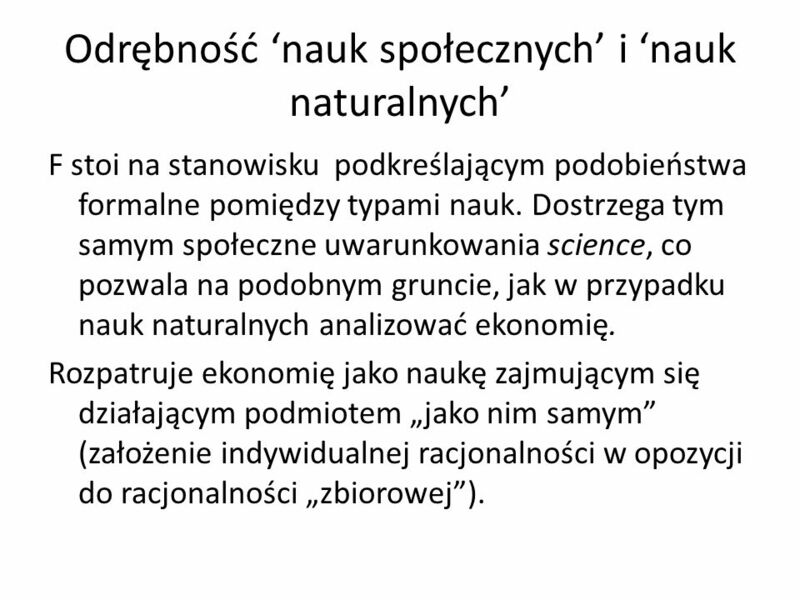 Dostrzega tym samym społeczne uwarunkowania science, co pozwala na podobnym gruncie, jak w przypadku nauk naturalnych analizować ekonomię. Rozpatruje ekonomię jako naukę zajmującym się działającym podmiotem „jako nim samym” (założenie indywidualnej racjonalności w opozycji do racjonalności „zbiorowej”). „Many countries around the world are today experiencing socially destructive inflation, abnormally high unemployment, misuse of economic resources, and, in some cases, the suppression of human freedom not because evil men deliberately sought to achieve these results, nor because of differences in values among their citizens, but because of erroneous judgments about the consequences of government measures: errors that at least in principle are capable of being corrected by the progress of positive economic science”. 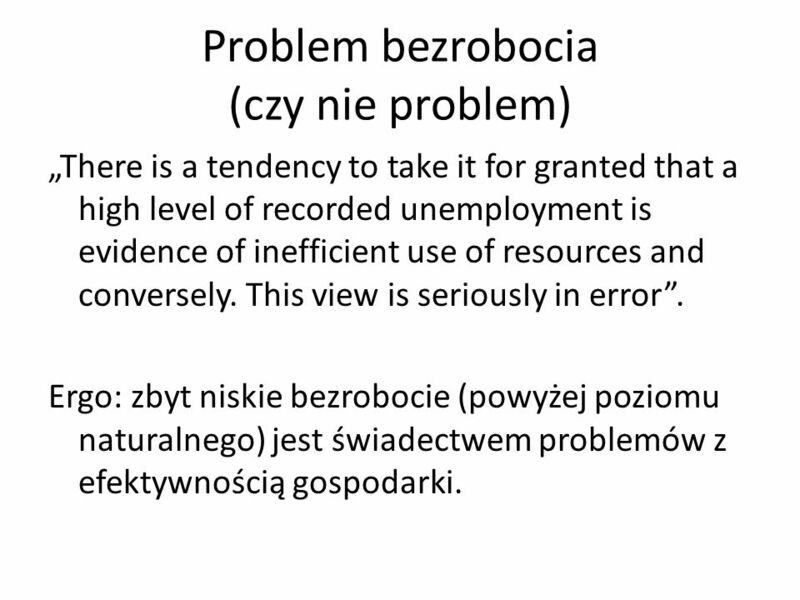 4 Krzywa Philipsa “… there is a stable negative relation between the level of unemployment and the rate of change of wages - high levels of unemployment being accompanied by falling wages, low levels of unemployment by rising wages”. 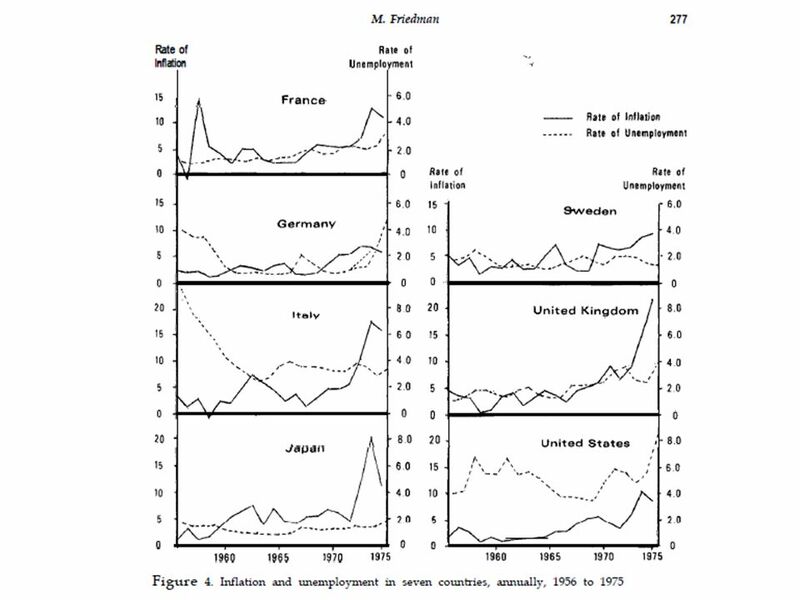 „The phenomenon of simultaneous high inflation and high unemployment increasingly forced itself on public and professional notice, receiving the unlovely label of <<stagflation>>. 6 Co w praktyce nie gra? What mattered for employment, we argued, was not wages in dollars or pounds or kronor but real wages - what the wages would buy in goods and services. Low unemployment would, indeed, mean pressure for a higher real wage - but real wages could be higher even if nominal wages were lower, provided that prices were still lower. Similarly, high unemployment would, indeed, mean pressure for a lower real wage - but real wages could be lower, even if nominal wages were higher, provided prices were still higher. 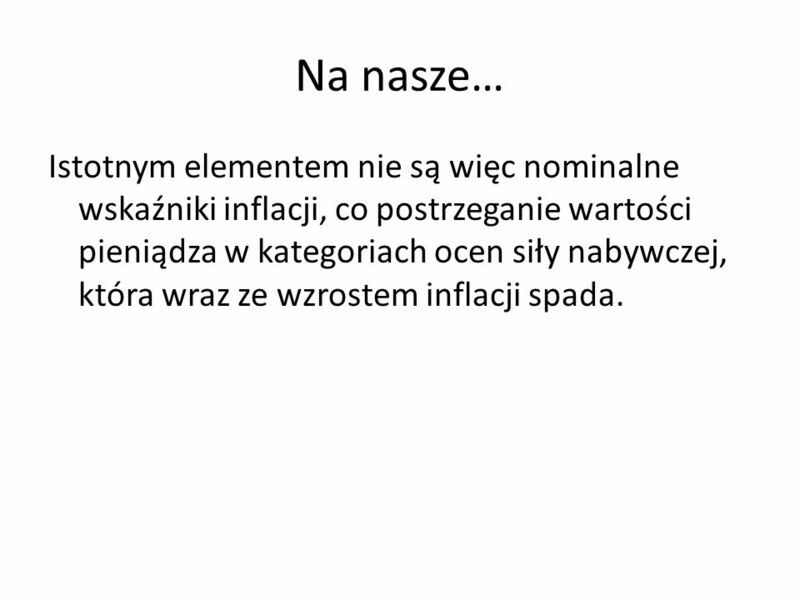 7 Na nasze… Istotnym elementem nie są więc nominalne wskaźniki inflacji, co postrzeganie wartości pieniądza w kategoriach ocen siły nabywczej, która wraz ze wzrostem inflacji spada. 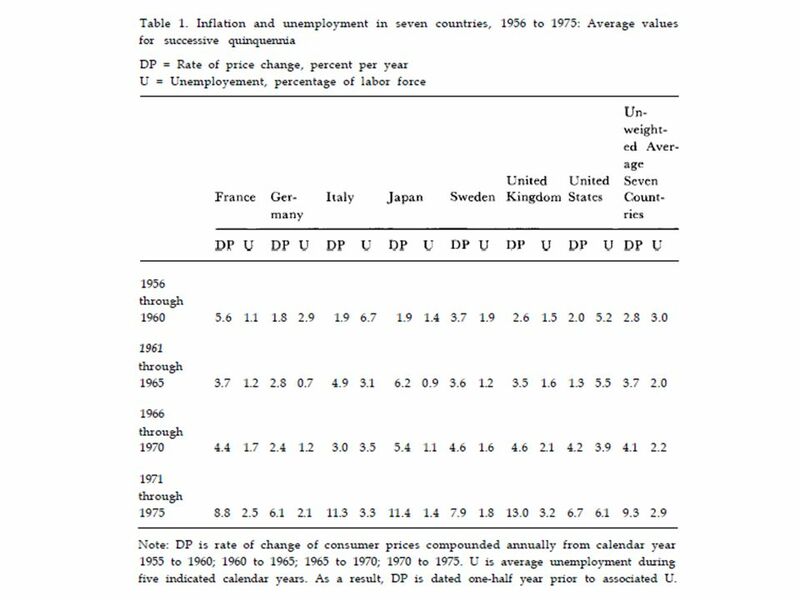 „… key points: what matters is not inflation per se, but unanticipated inflation; there is no stable trade-off between inflation and unemployment; there is a “natural rate of unemployment” (UN), which is consistent with the real f-o-rces and with accurate perceptions; unemployment can be kept below that level only by an accelerating inflation; or above it, only by accelerating deflation. 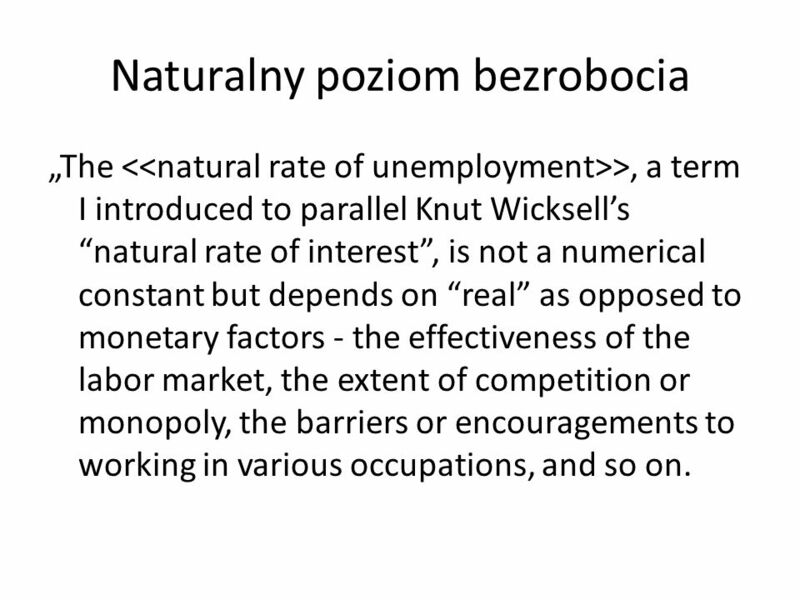 „The <<natural rate of unemployment>>, a term I introduced to parallel Knut Wicksell’s “natural rate of interest”, is not a numerical constant but depends on “real” as opposed to monetary factors - the effectiveness of the labor market, the extent of competition or monopoly, the barriers or encouragements to working in various occupations, and so on. I. „… the natural rate has clearly been rising in the United States for two major reasons. First, women, teenagers, and part-time workers have been constituting a growing fraction of the labor force”. Zatem wzrost osób czynnych zawodowo wzmaga poziom naturalnego bezrobocia. 12 II. 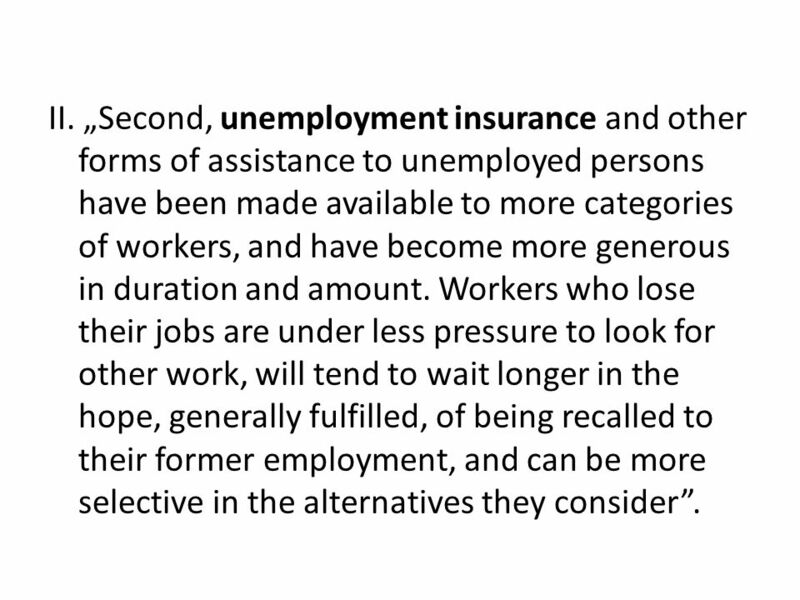 „Second, unemployment insurance and other forms of assistance to unemployed persons have been made available to more categories of workers, and have become more generous in duration and amount. Workers who lose their jobs are under less pressure to look for other work, will tend to wait longer in the hope, generally fulfilled, of being recalled to their former employment, and can be more selective in the alternatives they consider”. „There is a tendency to take it for granted that a high level of recorded unemployment is evidence of inefficient use of resources and conversely. This view is seriousIy in error”. 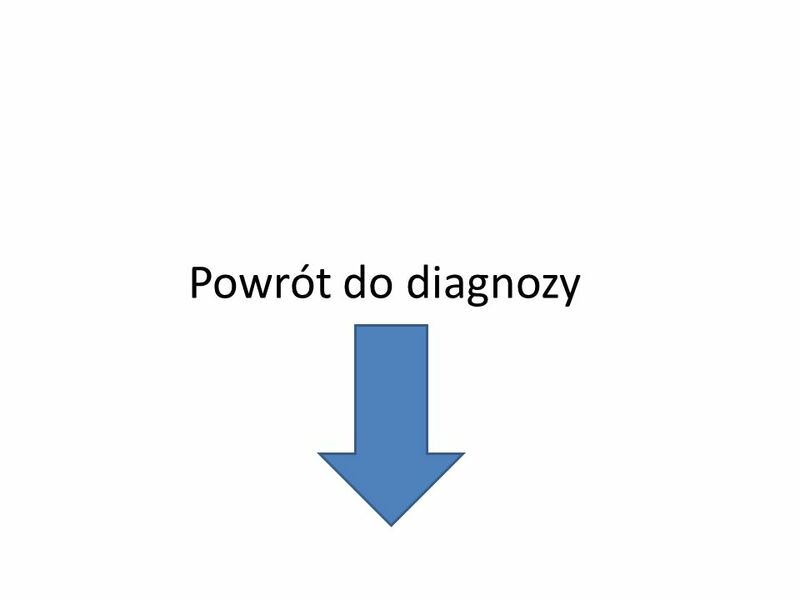 Ergo: zbyt niskie bezrobocie (powyżej poziomu naturalnego) jest świadectwem problemów z efektywnością gospodarki. 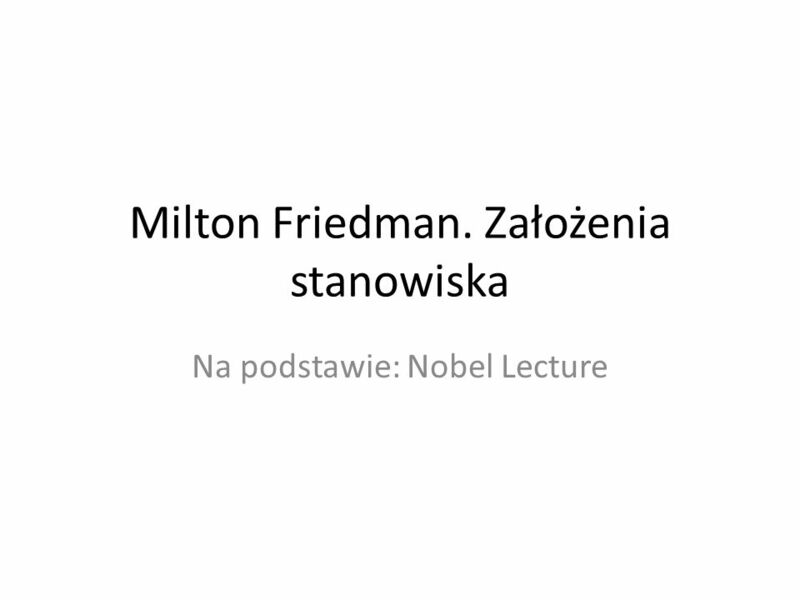 Pobierz ppt "Milton Friedman. Założenia stanowiska"